This is truck from the same guy who has that tow truck that was posted not that long ago. Maybe a bit too shiny for some, but me likey likey!.. Great looking truck. Someone put in a lot of time. But, I don't think it is a 26. Cowl looks just like my 25 pu. Great looking truck, It sure looks like the front wheels are horribly towed in. On the TT trucks the 26's looked just like the 25 and earlier ford was using up leftover parts from the model T line I don't think it was until late 26 or early 27 when the TT's started to look more like the "Improved Fords"
We don't know the serial number, and I'm not educated enough to go by body details, but it has a 26-27 transmission. Perhaps a bit overdone, but I sure wouldn't turn it down. It is a 26, it has the T-moldings on the back of the cab where the panels meet up, you can see them in the end of the film. My grandfather would have referred to this as a "carnival wagon" for the bright wood and non-black body. down before I drove it. Nice picture Burger and a good looking truck. For G.R. Cheshire -- the normal production USA Ton Trucks never went to the 1926-27 improved style look. They continued to use the same 1925 front fenders and 1925 hood all the way through 1927. They did get the wide pedals and the oval ignition switch/amp meter plate. Below shows the oval ignition switch from the u-tube video as well as the wide pedals. Ref: http://www.mtfca.com/encyclo/1926.htm that states: "The �Improved Fords� for 1926. A Roadster-Pickup was in the line but is not illustrated here. Trucks [Ton Trucks] continued in the 1925 style." So the roadster pickup was in the 1926-27 style but the Ton Truck was not. On page 405 of Bruce McCalley's (R.I.P.) 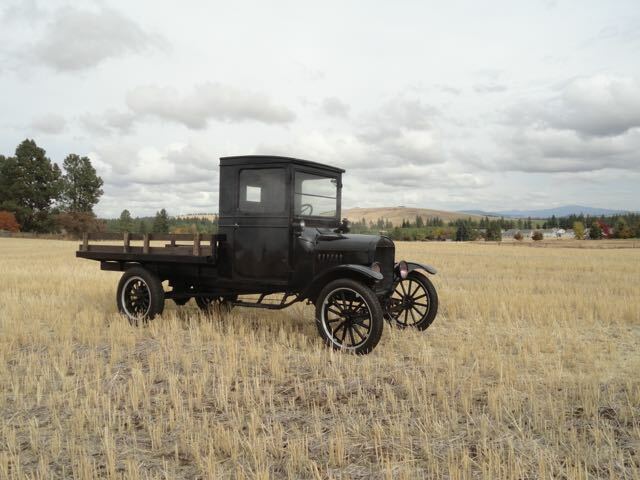 book "Model T Ford" he shows a Ton Truck with the improved front fenders, hood, and cowl. But it is assumed to be a prototype that never went into production. The 1928 Model A Ford Ton Trucks did use the same fenders, hood, gas tank/cowl as the 1928 regular cars (not the Fordor/Cabriolet but the Tudor/Coupe/roadster/touring car gas tank and lower cowl). That is a nice looking Ton Truck in the video. (Note it does appear to have the earlier 1918-1925 short running boards rather than the later longer 1925-1927 TT running boards see the 52 seconds into the video mark � ref: http://www.mtfca.com/encyclo/P-R.htm#rb ). But overall a really beautiful Ton Truck. Lot of time and money in that truck. Probably wouldn't get what he's got in it. Really nicely done. A parade pleaser.